With Argentinian mineral resource exploration legend Joseph Grosso at the helm, Golden Arrow has got serious pedigree when it comes to ground-breaking discoveries. Grosso, head of the Grosso Group, has been responsible for several world-class discoveries in Argentina which now make up cornerstone projects in some major mining portfolios. Grosso has been operating in Argentina since 1996 and his exploration achievements include Yamana Gold’s Gualcamayo gold mine and Pan American Silver’s Navidad deposit. The deal with SSR, formerly Silver Standard Resources, leaves Golden Arrow and its shareholders with a 25% interest in the Chinchillas project, SSR’s Pirquitas project and the associated mill while SSR holds the remaining 75% in an agreement which sits perfectly for both companies’ future potential. Chinchillas is a development stage silver project. A recent preliminary feasibility study demonstrated the discovery has mineral reserves of 11.7 million tonnes (mt) containing 58 million ounces of silver at 154g/t and an average silver equivalent production of 8.4 million ounces over an eight-year mine life. To fully understand why a 25% share of the project was a highly successful outcome for Golden Arrow and why SSR is taking on a project with several steps to take to production, it is crucial to understand the external factors. Firstly why SSR wanted to take on the project. SSR has been operating the Pirquitas gold mine and plant, situated just 35km from Chinchillas, for the last eight years although now it is reaching the end of the available ore at the project. The company has also invested around US$500 million on developing a highly efficient, state-of-the-art processing plant at the project. But it is facing the circumstance of having to close operations, losing 90% of the asset value and being unable to recoup anything from the plant. As Grosso explains, SSR would lose the investment, as well as having to pay US$40-70 million reclamation costs, and importantly the specialised labour and engineering team comprising 650 mining professionals would be dissolved and the expertise and jobs would be lost. Grosso likens SSR’s situation to a scene for an airline when it realises that it has run out of fuel and there is no way of knowing when it will get any more. The risks it presents for the airline are comparable to SSR. So, without Golden Arrow’s Chinchillas resource, SSR was facing finality at Pirquitas and consequences it did not want to consider. From Golden Arrow’s perspective they were also facing unfavourable odds without SSR’s intervention. Chinchillas had everything you could want for an exploration project moving up the development curve but the road to production without a partner is fraught with risk for a smaller exploration firm. It would take at least six to seven years to move through the necessary stages to get the project into production, and likely raising the money and building a new processing plant would take at least a decade. Firstly, Golden Arrow would have to survive for that long, but most pressingly in Grosso’s mind was the almost total dilution of the company its shareholders would face in that process. Grosso suggests the shareholders would be left with somewhere around 5% of the company after that process, but with the current deal they hold 25% and crucially that is without going through the laborious decade-long process of taking exploration success into production. As it stands Golden Arrow has secured 25% of the earnings on a long-term project and was handed an initial cash payment by SSR of US$15 million for its share of earnings at Pirquitas since October 2015. The deal comes down to the way the two companies complemented each other in terms of what they lacked. 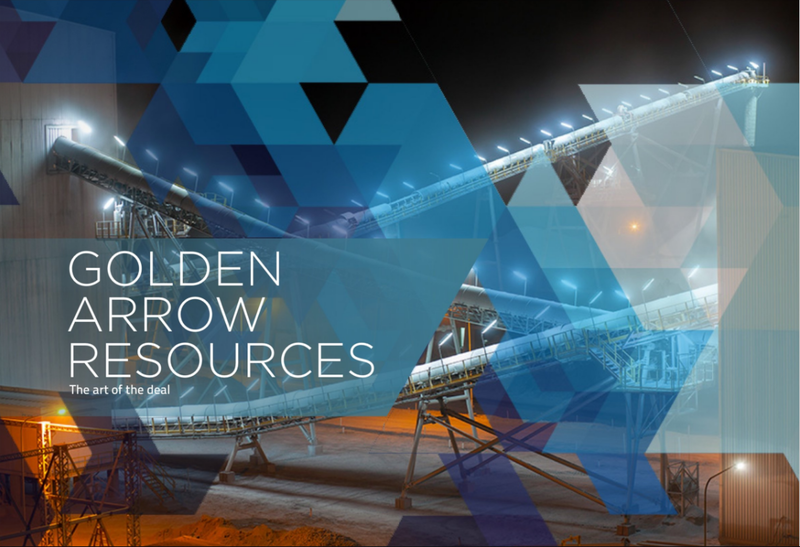 SSR could supply Golden Arrow with a large workforce, an existing processing plant and the finances to build its project and Golden Arrow could provide the solution to SSR’s terminal problem of running out of ore with a new deposit. A win-win for all parties. “It is a synergy that is unheard of. The synergy that they were facing finality for sure and we were facing a very long and diluted road to get to production. Bringing the two companies together was an instant resolution,” asserts Grosso. The deal makes Golden Arrow a mineral producer overnight and provides access to economies of scale that would have taken years to establish. The facilities at Pirquitas and the 650 direct labour jobs currently held are the stuff dreams are made of for exploration juniors. But as Grosso explains, production and exploration are two worlds apart. As an experienced explorer, Grosso places the most importance on community relations, being congenial with stakeholders and having a skilled team in charge. However when a project reaches production it opens up a whole new raft of challenges in metal prices, efficiency measures and production skill. The Pirquitas plant will operate on stockpiled resources until Q1 2018 and, subject to permitting, the two companies are expected to fully integrate by the second half of 2018, at which point ore will be trucked from Chinchillas to be processed at Pirquitas and the profitable relationship will enter its first phase. The capex to get the project into production has been identified at US$81 million, although that figure includes 21% contingency. Golden Arrow is facing around US$21 million for its share of the capital cost and with the US$15 million in the bank from SSR it is in a healthy financial position. In addition to the deal with SSR on Chinchillas, Golden Arrow is sitting on a portfolio of prospective exploration targets, often in near proximity to producing mines. It currently has a property position of 215,000 hectares of exploration ground in Argentina and Grosso has an innovative plan to maximise value for the shareholders. The mining veteran is spinning off the exploration assets under a new 100%-owned subsidiary of Golden Arrow, called New Golden Explorations, which plans to seek venture capital for funding its exploration programs, including a listing on an exchange. “We would like to raise no more than 40% dilution, so we will end up with no less than 60% and the venture capital will provide the rest. “We are very excited about this exploration company because it is our forte, it is our experience and what we are known for. We will be working on new discoveries which benefits the shareholders in two ways. “We will own 60% so the shareholders won’t have to put up any money. The money earned from production will stay in Golden Arrow to acquire new participation in new income production companies with no exploration or development costs such as financing a small mine for example. The IPO is expected early 2018 and with the SSR deal hitting full production mid-2018, Grosso is expecting next year to be a major turning point in the company’s future as it becomes a long-term producer supplemented with value-add exploration.